A Collection Of Contemporary And Native American Themes. In Quechua, one of the traditional native language of the Incan culture, Wayra is the word for Wind. Since 1989, Jaime Rodriguez (Wayra) has enjoyed an extensive performance and recording career as the founder of the traditional Incan music bands Llaqtaymanta and Inca Pacha. The exotic sounds of traditional Incan music can be dated back as many as five hundred years, representing one of the most well preserved forms of Native American culture. Llaqtaymanta toured throughout Europe presenting the music of the Andes to appreciative audiences. Adapting some western influences, Wayra formed Inca Pacha, a group blending the stories of the ancient culture of the Andes mountains with contemporary arrangements. Inca Pacha's two US releases (The World Of The Andes, and Spirit Winds) feature the traditional instruments of Wayra's homeland, in the musical styles of carnival, cancion, tonada, and san juanito. The enthusiasm generated by Wayra's live performances throughout the United States and Canada has resulted in Wayra's first solo release "Wayra - A Collection of Contemporary and Native American Themes". As a solo artist, Wayra is the consumate performer - vibrant and personable, his musical arrangements reflect his expertise and energy. 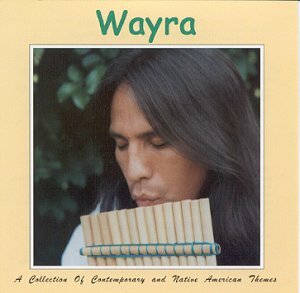 Traditional songs are given new life and contemporary songs acquire the timeless sensations of the mystical pan pipes, flute, and natural effects in this romantic collection by Wayra. Wayra is performing live at festivals throughout the Northeastern and Southern US and Canada for the remainder of 1998, and is currently scheduling appearances for 1999 and 2000.